This work combines two early pamphlets by F. H. Bradley (1846-1924), the foremost philosopher of the British Idealist movement. 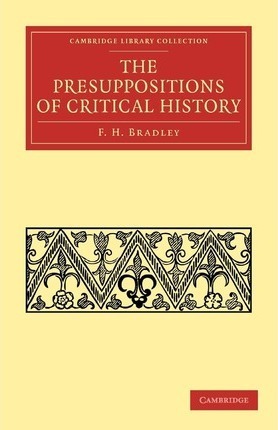 The first essay, published in 1874, deals with the nature of professional history, and foreshadows some of Bradley's later ideas in metaphysics. He argues that history cannot be subjected to scientific scrutiny because it is not directly available to the senses, meaning that all history writing is inevitably subjective. Though not widely discussed at the time of publication, the pamphlet was influential on historian and philosopher R. G. Collingwood. The second pamphlet is Bradley's critique of Henry Sidgwick's The Methods of Ethics. Sidgwick was the first to propose the paradox of hedonism, which is the idea in ethics that pleasure can only be acquired indirectly. Published in 1877, this work is divided into three parts, treating Sidgwick's definitions, arguments, and his view of ethical science. Preface; Presuppositions of critical history; Mr. Sidgwick's Hedonism: an examination of the main argument of The Methods of Ethics.